1.25 ACRES. OWNER FINANCING AVAILABLE. Excellent opportunity for investor, developer, or large estate. A3-1 zoning provides a variety of uses. Size is 165' x 330'. Taxes in 2018 are $376.96. Good roads all the way. Seller pays title insurance and doc stamps. Location is 1/4 mile east of Lehigh Acres, just in Hendry County. From Lehigh Acres - East on East 16th St to end, north on Hines 1/2 block, then east (right turn). Cross over Hendry County line. Go straight for 1/4 mile, then south on Wheeler Rd. 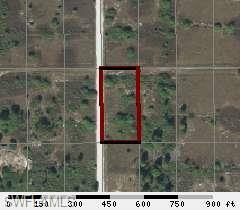 Property is located on the southeast corner of 15th Terrace and Wheeler Rd. Look for sign. To view Google Map - click "MAP" icon above, left of main picture. NO FLOOD ZONE - This property is located in a NO FLOOD ZONE according to Hendry County. Buyers should confirm this designation with their bank and/or insurance provider.